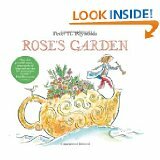 "Rose's Garden" is a lovely story inspired by and dedicated to a very special lady named Rose Fitzgerald Kennedy, mother of Senator Ted Kennedy and President John F. Kennedy. Like its inspiration, "Rose's Garden" celebrates the sharing of natural beauty and the true spirit of community. Faith to overcome disappointment and endless obstacles is the true strength that builds communities, nations, and beautiful flower gardens such as Rose's greenway. Although Rose's teapot collection of beautiful flower seeds from her travels around the world are depleted by hungry birds before she can plant them, she still manages to plant a few. Joined with the beautiful paper flowers that are gradually given to her for her beautiful garden by children from many corners of the globe, her flowerbed eventually produces its first real blooms after many setbacks and delays. Design the inside of the fantastic Teapot. How did it move on the water? Where did Rose live in the teapot? Design a container that kept the seeds healthy. Can seeds go bad? Design an instrument to get the seeds from the flowers. What are the seeds to the flower? Design something to protect the seeds from the birds. Do some birds help plant the seeds? Design some devices to help take care of the soil when it rains, when it's dry and cold. How do we make a garden grow? Design a way to make many paper flowers versus just one at a time. What tools would you design? A message of perseverance, community and empowerment for all ages.